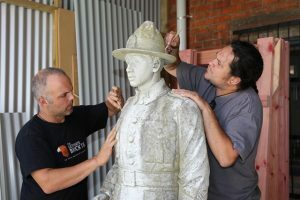 Marco Buerger and Aaron Te Rangiao from Goldfield Stone, a Christchurch-based stone specialist company, working on the statue. This week staff at the Sarjeant Gallery Te Whare o Rehua are honoured to be installing in the Gallery an extraordinary addition to the Dunedin Public Art Gallery touring exhibition ANZAC Photographs by Laurence Aberhart. The Gallery has been providing storage for the statue of Herewini Whakarua that was removed from the memorial commemorating the lives of seventeen Maori men from the district who lost their lives in World War One (WW1). The removal of the statue from the top of the ten-metre high column at Pākaitore was the first stage in a restoration project to be completed by Anzac Day this year. The statue has recently been cleaned to remove lichen and the effects of being exposed to weather; repairs to the rifle will be undertaken before the statue is reinstated. The restoration work by Christchurch-based stone specialists Goldfield Stone has been made possible through a significant grant to the Pākaitore Historic Reserve Board from the Lottery World War I Commemorations Committee. Whanganui has three memorials commemorating men from the district who died in WW1, the first, a cenotaph was unveiled in Queen’s Park in 1923 features the names of Pākehā and Māori. The second, the memorial tower on Durie Hill that opened in 1925. Both of these were Pākehā initiatives and historian Ewan Morris suggests that Maori played little part in these two memorials. Instead a separate committee was formed and they planned a third monument that would specifically commemorate the town’s Māori soldiers. The memorial was sited at Pākaitore (Moutoa Gardens) and features the names of the seventeen men who were primarily from Whanganui town, the communities of the upper river and South Taranaki. One of these men was Herewini Whakarua (Ngā Rauru) of Waitōtara in South Taranaki. Herewini was the son of Te Iwiora Tamaiparea and Te Ata Owhiro (who died of Typhoid fever in 1907). Herewini was then whangai’d (fostered) by his mother’s sister, Kuki who was the wife of Rima Wakarua. Herewini went to war in February 1915 and served in Gallipoli and later at the Western Front in Europe and it was here that he was severely wounded and where he died in hospital on 13 January, 1918. He was buried at the Lijssenthoek Military Cemetery in Belgium and at the time of his death he had attained the rank of Warrant Officer Class II Sergeant Major. This Carrara marble statue was commissioned by his aunt and uncle and was intended to be placed in the family urupā (graveyard). The statue is a remarkable likeness to Herewini and is extraordinarily detailed, far more so than many other memorials around the country and unique in that it is of a specific person. The memorial was unveiled on Anzac Day in 1925. 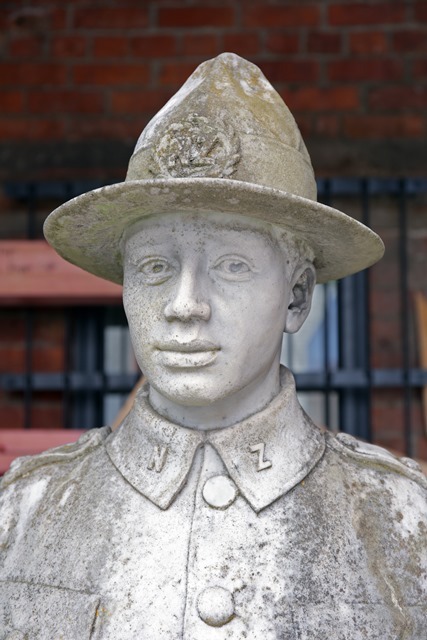 The scheduling of the exhibition ANZAC by well-known photographer Laurence Aberhart has been timely in that the Sarjeant Gallery can now provide the public with the rare opportunity to view the statue of Herewini Whakarua in the context of other memorials. More importantly visitors can view this extraordinary piece of craftsmanship at ground level before it is returned to its lofty position for Anzac Day Commemorations in 2015.